In 1854, 147 people left their homes in Canton Graubunden, Switzerland, to come to America. They left on 7 April 1854 and arrived in New York on 8 June 1854. After a quarantine period on Long Island, they crossed over the Erie Canal and wintered in Toledo, Ohio. The next spring most of them continued west to Stillwater, Minnesota, where they found jobs as lumbermen. Trouble in the lumber industry caused many to leave Stillwater in search of a new location. The earliest Swiss to reach Le Sueur County in Minnesota appear to have been Francis (Frank) Tambornino and Jacob Beer. They were the only two Swiss listed there on the 1850 census. After they secured land for themselves and their brothers, they wrote to inform them of this. Word quickly spread among the villages of the Vorder Rhine about these fertile fields in America. The Swiss wanted to settle in a rural location, away from the larger cities, and Le Sueur appeared to be what they required. They chose a spot on a piece of high land just west of what is now Le Center. At that time it was all forest and needed to be cleared. They immediately went to work, clearing the land and using the trees to build crude log cabins in which to live. It was clearly their intention to continue their Swiss lifestyle through communal living and through the establishment of a colony to attract other Swiss. Being a deeply religious group, it was very important to them to build a church. 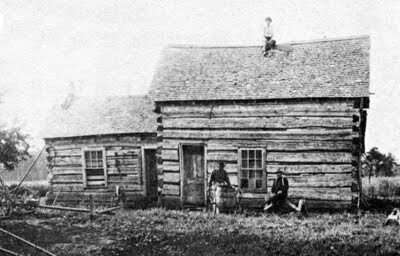 In early 1857 approximately 12 families came together to cut and haul logs for building. Boards for the roof were hauled to the saw mill by using the lone ox team owned by the Tambornino family, and the shingles were made by hand. They raised the building and put on the roof within one month. It was simply a log cabin, quickly constructed, but it gave the settlers a feeling of permanency in this new colony. Because it was not yet a sanctioned parish, Father Cornelius, a priest from Shakopee, rode his horse to visit the farms in the area, ministering to the people, until the families could celebrate Mass in the new church. The first baptism was that of Veronica, daughter of Joseph A. Jaeger and Mary Wolf, born 13 January 1857. The first to be buried in the cemetery was Elizabeth Schwartz, 13 January 1861. This first simple church was located on the township line between Sharon and Lexington, with log homes surrounding it. Two huge trees remained for many years, marking the spot of the old chapel. In 1869 Father Zuzek was pastor. The number of families had increased to approximately 28 and the log church was unable to accommodate the growing settlement. The parish raised about $1,200 (a considerable amount for the times) to rebuild the church a third time. There was a bit of a dispute as some members of the parish wanted to relocate the church again, but they eventually agreed to rebuild it on the same spot. The new church was built of finished lumber. The altar in the old church was moved to the new one. The men built the pews themselves (these were eventually replaced by pews from St. Mary’s Church in Le Center.) The stained glass windows were carried 13 miles from St. Peter on the backs of the strongest men. Each window carries the name of the family who donated it. The communion rail came from the first chapel of the Little Flower (now St. Therese Church) in St. Paul. The contract for carpenter work went to Plazi Bass for $25O and the painting was done by Mr. Woods for $1OO (he had to furnish the paint). The masonry labor to build the foundation and chimney was donated by Jacob Freiberg. St. Henry pray for us; Virgin most sorrowful, pray for us. In 1885 additions were added to the structure, giving it the form it has today. The Feast of the Corpus Christi is still a significant event for the parish. The early Swiss who settled in St. Henry spoke Romansch among themselves but it became necessary to learn English in order to communicate with others. They were very isolated in the country, without roads and with no means of communication. They suffered through winter blizzards, summer fires, grasshopper plagues and droughts. The farmers grew wheat, barley, corn, oats, potatoes and all of the things they had been unable to grow in the Alps. They canned vegetables, dried meat, made sauerkraut, made jelly from wild berries, churned butter and made cheese to help them through the winter. When they could, they slaughtered a pig, cow or goat from the herds. Winter months were spent in quiet and solitude. They often had to rely on snow shoes and sleighs to get around. They greatly missed being able to mountain ski. Summer meant long days of hard work from sun-up until night. Furrows were dug with the horse and plow, and seeds were planted by hand. Grain was cut with a binder pulled by horses. Bundles were stacked by hand into shocks. Hay was mowed, turned to dry and finally pitched by hand and hauled to the barn for winter feed. In later years they would have threshing crews come which was a highlight of the season. The thresher would come steaming in with the whistle blowing and 16-18 men on the crew. Housewives, who had prepared for several days before, were ready to feed the hungry crew, sometime for several days, including lunches which had to be taken out into the field. The housewife took great pride in keeping an immaculate house. Among her duties were: making soap from waste lard; caring for the vegetable garden; preserving meat and vegetables; and making candles. A small flock of sheep was kept to provide wool. After the sheep were sheared, she would wash the wool and either spin it into thread for knitting or use it as batting for quilts. She knitted all the socks, mittens and sweaters for her family. She stitched all of their clothing by hand before she had a sewing machine. In addition to this, she often went into the fields to help her husband. The St. Henry housewife was never lonely. She enjoyed a close and friendly relationship with her neighbors and they often got together for warm social gatherings where "woman talk" could be exchanged. They were always ready to help each other in times of sickness and childbirth. The children enjoyed a happy and secure life. The younger children played with handmade toys and dolls, and were lovingly tended by their elder siblings. The older children went to school where they enjoyed games that required nothing more than imagination. They played Ante-Ante-Over, Crack the Whip, I Spy, and Hide and Seek. When not doing their homework, the boys went into the field to help their father and the girls worked in the house with their mother. There was always plenty of work for them to do. They found a good home in St. Henry and built a good life for themselves. There are numerous descendants of these early Swiss still living in Le Sueur County, as well as all over Minnesota.